Welcome to my stop on the New Horizons Valentines Day Blog Tour. Keep reading until the end for details about the sale and a chance to win some great prizes from our sponsors. I’m excited to share my Valentine’s Valencia (affiliate link), in rayon spandex from Mily Mae Fabrics. I sewed my first Valencia about a year ago. It was during testing for the Marbella (see my version here), a tank and excellent companion pattern for layering under the Valencia. I tried out the solid front and back, curved hem, and 3/4 sleeves. True to New Horizon form, amazing options, terrific fit, instructions that don’t leave you hanging. Check out this gorgeous curved hem! 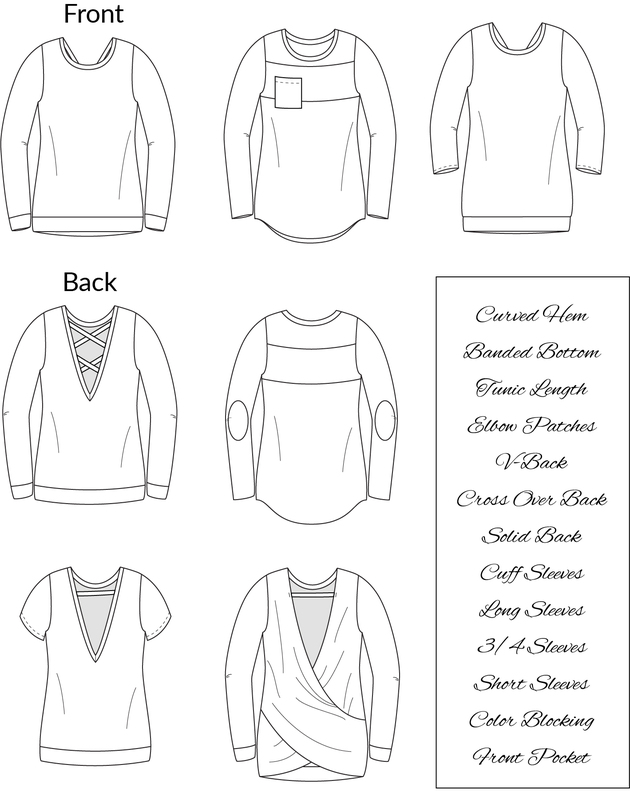 When I started sewing knits, I was confused by all the different types of fabrics and their content. I quickly learned stretchy fabrics were not all created equal. I’ve always loved more natural fibers (breathability!) and was immediately drawn to cotton lycra. It is a fairly stable knit so easier to sew than something slinkier like ITY. It also has excellent stretch and recovery so can technically be used for nearly everything – – – dresses, skirts, leggings, tops, bands, etc. I used it here, here, and here. The one downside is that cotton lycra doesn’t drape the best. I don’t hesitate to use it for tops for my kids but unless its a fairly structured garment, I prefer something with a little more flow to it for myself. Rayon is soft like cotton (more slippery) and will breathe like cotton but had the advantage of draping beautifully. Typically, rayon spandex may have great stretch but it is not renowned for its recovery. So, unless there is a decently large neck opening, you don’t want to use rayon spandex for bands. I wish I had scooped up these yellow dots too, they make me feel so happy! Secret tip: Watch the Mily Mae website tomorrow at 3PM PT for an amazing stocking! I’ve really fallen in love with neck bindings since I got my coverstitch. So much easier and look gorgeous every time! Cotton-based French Terry such as the geometric print fabric I used here and here. Rayon-Poly blend French Terry such as what I used for my first Valencia (below) as well as other projects here and here. This is the drapey softer sort of French Terry, perfect for the cross over back Valencia! I do sew non-natural fibers too. I’m a huge fan of double-brushed polyester, especially in the cooler months. See this post for how I wore DBP in the summer. And I could not live without my drapey cozy sweater knits in the winter (see here, here, and here). Bonus points in my book if its a brushed sweater knit like this one I used for this Tawsha dress (full blog post here). I have a grey sweater knit planned for my next Valencia, it will be a cross over back version. shoulder details in quilted knit. Wanna See More Gorgeous Garments? Without Further Ado – – – PRIZES! Surge Fabric Shop is offering bigflynotions readers 15% off with code NHBUNDLES15 on the exclusive bundles here. I’m especially swooning over that mustard bundle. a small commission when buyers use my link to make a purchase. Next PostWhat Happens after you KonMari your Wardrobe? Stop being so dang cute! Awe thank you my friend, I could live in leggings and curved hemmed tops!